The Super, the Managing Agent, the Building Contractor and the rest of the team at 401 Broadway were all extremely helpful and responsive during my move and throughout my space renovation. My new, loft-like office, the absolutely stunning views and the vibrant neighborhood fuel my creative juices. I couldn't have asked for a better place to base my design business. 401 Broadway was designed by renowned architecture firm, Jardine, Hill & Murdock, and constructed in 1929-1930 — just as the Empire State Building was making its home in Herald Square. Similar in look and feel, both 401 Broadway and the Empire State Building boast Art Deco details; both were centers of commerce back in the 20’s and 30’s — and continue to be today. 401 Broadway is a 335-foot-high tower located on the Northwest corner of Broadway and Walker Street, with loft-like professional spaces. Many offer 360-degree, wrap-around views that capture uptown and downtown Manhattan, the Empire State Building, the Hudson River and many of the city’s celebrated bridges. 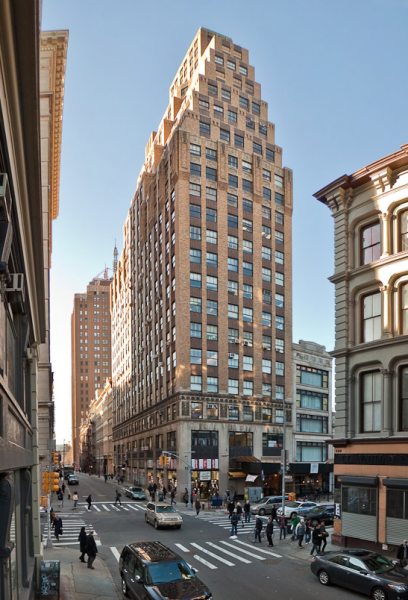 As it’s located in the Tribeca East Historic District, 401 Broadway is a contributing building in the landmark district. Its style, scale, materials, and details are among the significant features that contribute to the architectural and historic character of the district. Lovingly restored, the building’s lobby is reminiscent of days gone by, with charming architectural motifs and details that offer a warm welcome to tenants and guests alike. You’ll find 401 Broadway anything but typical — it’s a charming loft building with service that sets the stage for professionals to work, create and grow. For more information, contact Building Manager, Fanny So (212) 226-8363.